This video shows a little of last week's study tour. We are independent of local or national government and we don't only emphasize the good, but also show and explain things which should not be emulated. Following on from last year's successful study tour by Norwegian students, last week we had the honour of hosting a delegation of ten planners and officials from Trondheim. Trondheim has a similar population to Groningen and also a similar student population. A more highly educated population, in particularly the presence of a university, are almost always linked with a higher than average cycling modal share. Trondheim also has something that is unique and known to cyclists world-wide. It's the location of the famous bicycle lift. This is 130 m long and lifts cyclists 25 m up a hill with a 20% slope. It is an idea which other hilly cities which wish to encourage cycling may like to take up. 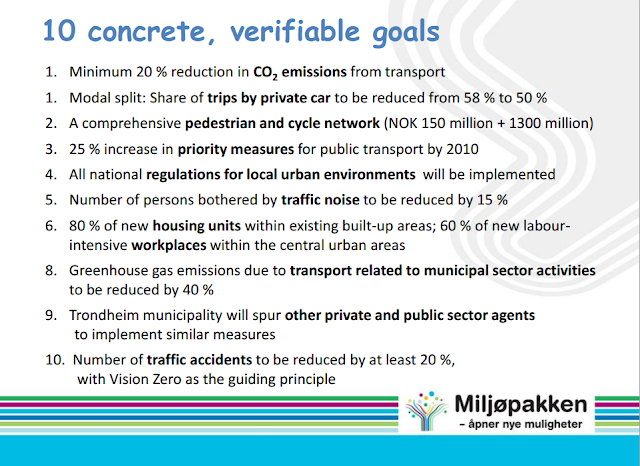 Trondheim's Miljøpakken ("Environmental package") sets some good firm goals. In order to achieve their desired CO2 emission reductions they must stop people from driving so much as they do at present. Trondheim already has a higher cycling modal share than many cities (overall share is 7-8% of journeys, varying from about 4% in winter to 12% in summer. The commuting share is about double the all journeys cycling modal share), but 30% of journeys of under three km within Trondheim are still by car and these are particularly to be targeted as being relatively easy to convert into bicycle journeys. As a part of the continuing development of the city, Trondheim seeks to improve standards further and to increase the cycling modal share - hence the study tour last week. It is unusual for a city to send so many people, and that in itself shows that cycling is being taken seriously in Trondheim. We are told that as a result of the tour, standards for future infrastructure will be raised, and this should be good news for everyone in the city, including people who do not cycle. 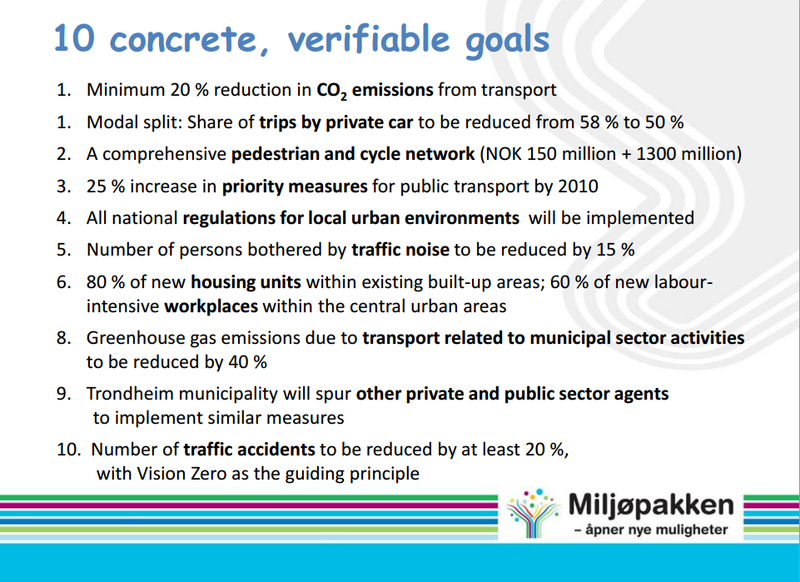 The budget comes out of road tolls and well over a billion kroners have been allocated to improving cycling infrastructure in Trondheim. It's enough to make a real difference. A promotional video for cycling in Trondheim. Trondheim has challenges which Assen and Groningen do not - it is a hilly city and winters are much colder than here. As a result of this, snow builds up to the point where it is far more difficult to deal with than here in the Netherlands. For these reasons the cycling modal share of Trondheim may never reach the levels of some Dutch towns, especially in winter. However, safety and convenience are the main issues for cycling. These are the same everywhere and there is surely room for growth over what the city has already achieved. We look forward to seeing further progress in Trondheim and we're available to help if needed. has featured in many other blog posts. Why come on a study tour ? Our study tours are quite intensive. We spend three days on the saddle with just one short evening presentation to sum up some of the things that we have seen. Spending so much time cycling makes the tours unique, but it's important that the tours operate in this way because it is only by having the experience of using the infrastructure that one can gain an appreciation for how well it works. The tours take in much within the cities of Assen and Groningen, including residential areas both old and new, commercial and shopping centres and also everything which connects these together. However, a true cycling culture is not only about "cycling cities". 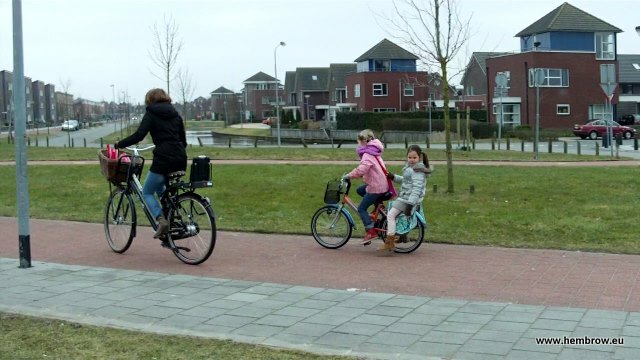 For that reason we also ride out of the cities to suburban areas and commuter villages and on the last day we cycle inter-city from Assen to Groningen so that the experience of those who ride longer distances between home and school or work can be appreciated. Participants on the tours see for themselves how important it is to have a comprehensive network of high quality cycling routes. Because we are independent both of government and engineering companies who build the infrastructure we show things as they are and not in order to promote either specific projects, construction companies or the councils who are paying for these projects. We are not constrained by politics or funding sources and we're not interested in hype. Not only do the tours feature the best infrastructure that we have to offer in this area but we also illustrate less good examples. This is important. Not everything in the Netherlands is worth emulating. Mistakes have been made here too, many things have been modified over the years but this isn't necessarily well known overseas. It's important to explain why some things are more valuable than others because it avoids expensive mistakes being made elsewhere. For example, we now include the most dangerous road junction in the whole of the Netherlands on our tours because we can then talk in the group about why this junction is dangerous and how to avoid these problems. Q: Why are they photographing us ? No two study tours are identical. People have different experience and interests and they ask different questions. We always do our best not just to talk about but also show people examples of answers to their questions. This is our eighth year of running study tours, but our experience goes back much further. We've cycled in several countries and we've been involved in campaigning for better conditions for far longer than we've been operating the tours. Previous participants on the tours have come from across the Americas and the South Pacific as well as from many countries in Europe. Our aim is to show everyone what is really required in order to "Go Dutch". Read other study tour posts, or read about our study tours, or go straight to the feedback from those tours. We can arrange tours specifically for groups of planners, politicians or campaigners from one place or individuals can join the next open tour in August. One of four different groups of school children that we saw cycling on school trips during last week's study tour. This is very common in the Netherlands. During the last day of the tour we were approached by a blogger in one of the suburbs of Groningen who asked us what we were doing. His post in Dutch can be read here. Last week we hosted a study tour group from Norway. There are always a few things that we discover that we've not seen before. This is one of them. A bicycle light vending machine. Bicycles parked at the university in Groningen - the indoor cycle-parking with the vending machine is just around the corner and helps to reduce stress here. of a rack it will be "towed away". The reason why we found the vending machine is that it was inside a free facility that we visited in which 725 bicycles can be parked indoor and are guarded. Like all cities in the Netherlands, Groningen has a bit of a problem finding enough space for all the bicycles to be parked without them being in the way. This is why bicycles are threatened with being "towed away" and why there are such initiatives as red carpets on sidewalks to reserve space for pedestrians. Ultimately the bicycles have to go somewhere, and providing indoor cycle parking which is free to use is one way of dealing with a part of the problem rather than simply punishing people which might lead to less cycling. That's why Groningen has built several such facilities in peak cycle-parking areas, such as next to the university and next to a cinema. When we were at this cycle-park last week on the study tour, there was someone vacuuming around the bicycles. Making sure that cycle-parking is clean and attractive and doesn't smell improves social safety and is part of what makes it work. See other examples of guarded cycle parking in other places. A blog post including details of the study tour will appear on Tuesday. Until then, read blog posts about previous study tours. Previous blog posts show a vending machine for inner tubes and a vending machine for complete bicycles. We sell similar emergency bicycle lights. Ours are cheaper than those from the machine.